Okay, we've made a decision. No, Effin's made a decision, and I'm dragging my boots in the mud. Her decision is to reduce the amount of time I spend mowing the lawn by tearing up a 20-foot by 46-foot rectangle of that lawn and replacing it with wildflowers. Effin pictures a riot of color right behind the house, a riot that requires no mowing, no watering, no muss, no fuss. I picture another kind of riot: animals lurking in the wildflowers (aka weeds), bees and other stinging creatures claiming the patch as their turf, and an experiment with potentially ugly results conducted right there on my beautiful back lawn. On the other hand... well, I do hate mowing the strip of lawn that the previous owners referred to as Heartbreak Hill. And I do like wildflowers, at least in meadows and woods. And... and Effin's usually right. So I relinquish my pessimism and commit myself to becoming The Wildflower Gardener. 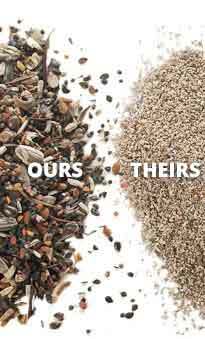 I order seeds from the Vermont Wildflower Farm, read the instructions, and roll up my sleeves. In truth, I start by rolling up my neighbor's sleeves. That is, the neighbor with the tractor, bucket loader, and disc harrow. On May 20, he scoops off the turf with the bucket loader, then tills the exposed soil with the harrow. And I make my first mistake. b. All that grass is going to come back as... weeds. Weeds, after all, are nothing more than persistent plants growing in the wrong places. When I had lawn, wildflowers were weeds; now that I'm to have flowers, grass is the weed. Sure enough, within a week little tufts of grass start reappearing. I pull them out as they emerge. This is the first intimation of work in my new work-free wildflower garden. Discoveries: Next I pull out an infestation of broadleaf weeds, root by root. Then I haul out an infestation of stones, rock by rock. Next I scoop out five buckets of pumpkin-seeded com­post from under the old outhouse and distribute it over my veggie garden and future wildflower garden. In the compost I also find bottles, jars and canning rubbers, one old paring knife, and a handmade iron slick, a tool for taking bread out of a hot oven. At last I'm ready to sow seeds, but before I do, I call American Meadows and pepper them with stupid questions. "The instructions say to water after planting. Can I plant in the rain instead?" No, you'll make a mess in the mud. "The instructions say to mix the seeds with sand. Can I use ash from the wood stove instead?" No, ash turns to lye when wet and can damage the seeds. "Can I plant when it's windy?" C'mon, Jules, the seeds will blow away. June 2nd dawns without rain and without wind. At 6:30 A.M. 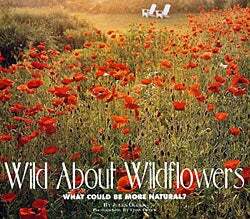 I mix two quarter-pound bags of Northeast wildflower seeds (half perennials: oxeye daisy, Shasta daisy, black-eyed Susan, purple cone­flower; half annuals: red poppy, cornflower, wild cosmos) with sand and scatter the mixture across the tilled soil. Halfway through, I panic: What if there aren't enough seeds to go around? I open the packs of All Annual Mix I was planning to save for next year and add them to the blend. Following the instructions that came with the seeds, I compact the entire garden by rolling it with an empty metal barrel. Although wildflowers don't require watering, young plants and seeds do. So I run the sprinkler most of the day. The next four days we're blessed with rain. When, on the fifth day, I drag reluctant dinner guests out to admire our new wildflower bed, a flock of juncos is grazing it. I commence yelling and waving my arms. To no avail. The little bug­gers fly a yard off the ground, circle, then land two feet from where they were eating. They continue their meal despite my animated presence. a. I'm a compulsive weeder. Always have been, always will be. b. I know, all too well, how dock, dandelion, grass, thistle, plan­tain, and pigweed do in Vermont. They love it here. They thrive here. And I figure that even if my wildflowers really are capable of choking out weeds, the least I can do is give them a head start. What I don't do is water. After the plants have made their first inch of growth, I turn off the hose and leave it off. I never see the slightest sign of wilt. The fruits of overenthusiasm: Apparently the juncos had little effect, for the young plants are coming up as thick as, well, as blades of grass. First to bloom is the baby's breath. Next come the red poppies. They're followed by cornflowers, and then by California poppies. By August 1 the garden is more than two feet high and growing fast. After an early-August, all-day, all-night down­pour, I see the disadvantage of too-close planting. Roughly a third of the flowers are lying on the ground unable to support the weight of their long light -seeking stems, now burdened with the added weight of water from a storm that delivered one inch of water. The mallows fell like trees in the forest, taking large numbers of coreopsis, farewell-to-spring, California poppies, and bachelor's buttons with them. I shake them off and try to stand them back up, but a quarter of my garden spends the rest of the summer in the prone position. Competitive gardening: On August 22 I visit my friend Steve's wildflower garden. His is a mass of weeds with occasional foot-high poppies poking through. I try to help him figure out what went wrong. First and worst was the bamboo problem. A small patch of bamboo had been growing on the hillside he was about to plant. The bulldozer he hired to clear the hillside of weeds spread bits of bamboo root over the whole area. Bamboo only needs half a chance to take hold, and once it has, it's yours for life. Second, though wildflowers aren't supposed to need rich soil, I have no doubt that my valley land (on which used to stand a chicken coop as well as an out­house) produced bigger and more robust plants than Steve's poor hill soil. The third difference is that I planted seed from specialists, and Steve got his in bulk from the local grain store. Admittedly, my packets were many times more expensive, but not one lupine germinat­ed from the four pounds of seed he plant­ed. His bargain was no bargain. On August 24 Steve comes to visit me. Oh, how I've waited for this moment! When he sees my garden--two-foot poppies, three-foot daisies, and five-foot mallows--he gasps. What's the fun of gardening if it can't be turned into a competitive sport, like football without body contact? Steve shakes his head and says, "You win." Touchdown! Germination period: My wildflower garden is now several seasons old. It con­tinues to produce tall, healthy plants that thrive without water or care. But it's not the garden I planted. Daisies, wild sweet William, black-eyed Susans, violets, and broadleaf weeds have crowded out the more colorful annuals. I have to decide whether to sit back and enjoy what I have or to plow it under and replant. I don't want to do that. So, was it a mistake to plant wild­flowers? The answer lies in another question: Are we tempted to turn the patch back into lawn? The answer is a resounding no. Wildflowers are much more fun than grass. You watch them change over the course of a season and over the course of several seasons. They provide cut flowers, attract hummingbirds, give dinner guests something to ooh and aah over. Wildflowers have become part of our lives, a part we'd hate to trade for something as boringly predictable as plain old lawn.